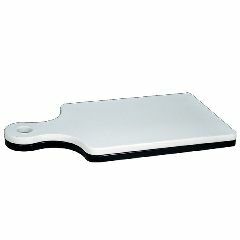 The Low Vision Black and White Paddle Cutting Board is a white board that reverses to black. The polyboard is odorless, sanitary, unbreakable, and resists scratching. Measures 6 3/4" x 14".